Most people today are familiar with SMS and MMS, better known as texting. For many cell phone users, texting refers to all messages (barring email) they send on their phones, regardless of the brand of phone they’re using. Texting today is available on virtually every phone and tablet. 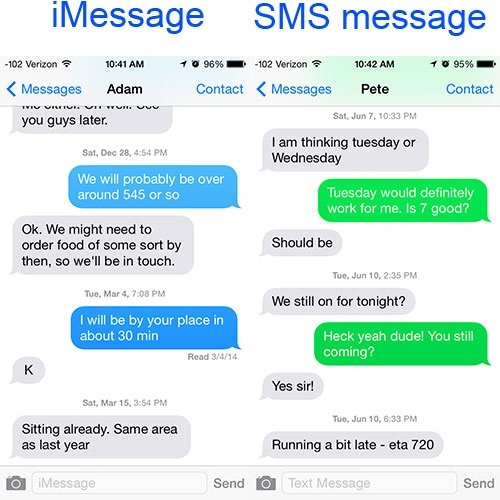 iMessages are very similar to text messages, and could be considered a kind of text message or instant message. iMessages are the native messaging technology of all Apple devices, and have more functionality and flexibility than traditional text messages because they are sent over the Internet instead of being sent over a cell phone plan. Text messages are sent through a text messaging plan as part of a contract with a cell phone provider. Today, text messaging is often unlimited, and is calculated separately from the data/Internet usage parts of the monthly cellular contract. Text messages usually cannot be sent over WiFi or data without the assistance of other applications. iMessages are not traditional text messages and are instead sent over WiFi or a data plan. You do not need a text messaging/SMS plan to send iMessages, but because they will use data, users without unlimited data plans will need to track their data usage every month. iMessages are encrypted as well. Text messages are generic and the technology is not specific to any phone manufacturer or cell phone contract provider. Therefore, most modern phones and tablets are built to be able to send both SMS and MMS messages. However, without a contract with a phone company, these messages cannot be sent. iMessages are specific only to Apple devices like iPhones and iMacs. They are not SMS or MMS messages, and perform best when sent between Apple devices – their functionality is perfectly compatible then. When an iPhone user sends an iMessage to a non-Apple device, it will sent instead in an SMS format that the other device can read. iMessages do not need to be sent just to iPhones, and can be sent to any Apple device, as they are essentially an instant message sent over the Internet. However, if a group chat contains any device that is not an Apple device, all the messages will be sent in SMS/MMS format in order to be compatible with that device. Text messages can be divided into two basic formats: SMS (Short Message Service) or MMS (multimedia messaging service). SMS refers to standard messages over a cell phone service that contain just text. MMS is based on SMS and also uses a cell phone service, but allows users to send videos, pictures, and other media. iMessages have the built-in technology of both SMS and MMS, and allow for even more functionality when sent between Apple devices. Along with sending files and media, iMessages can send stickers, location data, and certain app info. SMS messages are a standardized medium. Messages can only reach 160 characters before the phone will break the text into a new message, however many times it needs to in order to keep the 160-character limit. The character limit on iMessages is somewhat nebulous. There is no official character limit, although some users have received error messages when approaching 20,000 characters. If an iMessage is being sent to a non-Apple phone, the message will be truncated at 160 characters, like a traditional SMS text. Text message status indicators are not identical across brands and models. Many Android smart phones allow users to turn the “read” functionality on and off, which informs the sender whether or not their message has been read by the recipient. There can also be indicators for the delivery status, whether the recipient is typing, and more. iMessages have the “read” status indicator, and can show whether the other people in the conversation are typing. iMessages have an extra indicator, however, to show whether the recipient is also using iMessages: if the text bubbles are blue, everyone is using iMessages, and if they are green, SMS is being used. This functionality is useful for people who want to know if they are using data or their messaging plan, or for those who want to know what functions of iMessage are being used (like encryption). Texting and iMessages are both common ways of sending messages over phones, tablets, and other devices. Text messages require a cell phone plan, while iMessages use data or WiFi. iMessages can only be written and sent on an Apple device, but they can be sent to any brand of device. Text messages and iMessages can send media like videos, photos, and files, but iMessages have no character limits and extra features like stickers. Kelsey Robarts. "Difference between Texting and iMessage." DifferenceBetween.net. June 21, 2018 < http://www.differencebetween.net/technology/difference-between-texting-and-imessage/ >.